I posted this in response to one of Janet's posts in NCD and am bringing it here because Deep Ocean has been mentioned here by Kermit and perhaps others. I've added an article and link explaining the charter signed for the vessel Kyle is presently working on. DeepOcean has entered into charter party with Vroon Offshore Services for the charter of the newbuilding VOS Satisfaction. The vessel will be delivered to the ship owner and DeepOcean in January 2008. VOS Satisfaction is a dynamic positioned ROV/Survey vessel of about 60 meters length. The vessel will be outfitted with multibeam echosounders and a ROV system to perform route survey and seabed mapping tasks plus general lay support to clients with projects in the southern part of the North Sea, the Baltic Sea and the Mediterranean. The vessel will be chartered in for three years firm with two yearly options and will be operated from the DeepOcean's offices in Den Helder and Norwich. Interesting.Will have to research a little bit later! This site has a plethora of information on diving jobs of all kinds..
As there are many different GeoLabs....Just throwing it out there! I was going to ask you to post this here, but miraculously you did anyway. Thank you...I saw you did it earlier, and I am just able, now, to tell you. It's going to be a long weekend with the sharing. ORANGE CITY - Valero has 90 contract workers sent home. According to a letter that was sent to the contractors, the oil company to take this' because of the economic crisis and to continue to monitor costs. All employees of Valero will remain in service and just received their salary in the period that the refinery on non-active state. Valero know that there is no question that employees of a severance bonus is offered. In the same letter, however, hint Valero's own desire to sell the refinery. "In terms of strategic alternatives for the Aruba refinery is the search still ongoing. Valero continues to seek strategic alternatives for the Aruba refinery and verschiklende talks with interested parties. In this whole process so far Valero the interests of its employees at the refinery Aruban always prepared. 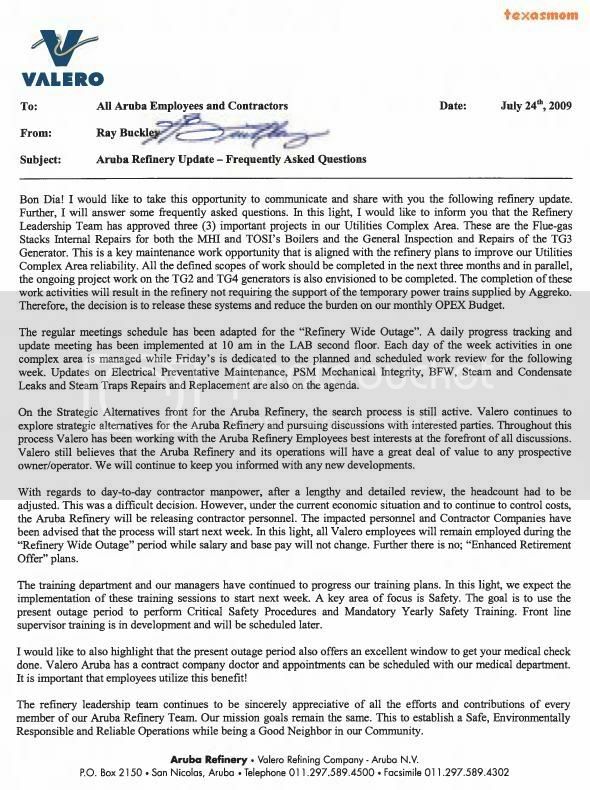 Valero continues to believe that the Aruba refinery and its operations are of great value for the potential owner / operator or the other. " This is the first release of Valero to its workers since the shutdown that about two weeks ago of force is gone. Employees and contractors have been in the dark getast regarding the future of the refinery. Meanwhile, Prime Minister Nelson Oduber in the local press to inform themselves no longer believe in the return as operator of the Valero refinery. Valero would Oduber currently busy looking for hard currency and the refinery in Aruba as soon as possible of the hand to do. Meantime, Petro China, Petrobras, and both a Russian and a Swiss company have expressed interest in the refinery. Of all these candidates seems to Petro China's most serious, despite reports that the company has so far not on a line with Valero and the country Aruba regarding the purchase price and tax conditions for the acquisition. In a statement to Bon Dia Aruba had Valero spokesman Bill Day know that the 90 workers who are sent home with only 15 per cent of the total number of contract workers. Furthermore, a possible sale of the refinery in Aruba have nothing to do with the purchase of another facility, according to Day. In the international press recently reports that Valero would be interested in a refinery in New Zealand. This is considered a rumor, according to Day. Valero would present no hurry to make purchases, provided that this' extremely well 'would be. Found this interesting. Never thought about the mineral rights. Also, Deepak still posts that he is in Dubai. Companies termed by United Kingdom's Financial Services Authority (FSA) as "unauthorised overseas firms" are seeking investment from the Gulf. Hundreds of such firms are listed on the FSA website. Particularly aggressive are firms that claim to invest in oil wells, especially in the United States. Owning land in the US brings mineral rights, unlike the GCC and much of the world where such rights rest exclusively with the government. An oil research firm categorised as an unauthorised overseas firm?by the FSA, has changed its name. But the two continue to share the same website and addresses. Yet another "warning" about Solomon's business dealings? Enquiries at the firm, which has its head office in Aruba and an administrative and a 'greeting' office in Florida, US, revealed that the Middle East and especially the Gulf states, are high on its radar for attracting investments. The company is advertising on Google and promises seven per cent return per month. "We do offer such returns and we are able to do that through the sale of oil that we produce after digging a well with the investors money," a company spokesman [there were three who reverted, one after another, on being sent an e-mail) told Emirates Business. The calls came from unrecognisable numbers. Calls received were similar in nature to the ones the FSA warns about. "Such firms are often involved in 'boiler room' activities and pose a high degree of risk to consumers. They frequently engage in tactics including cold-calling members of the public offering shares that later turn out to be worthless or high risk. The callers can be very persistent and extremely persuasive. If you are cold-called by an unauthorised overseas firm in relation to stocks or shares, you should be extremely careful," said FSA. "If you are contacted in such a manner, the FSA advises that you simply terminate the telephone call – the most effective protection against such unauthorised companies is to have nothing to do with them," it advises. An official, claiming to be senior advisor, said the energy research firm has been able to attract investments from the Middle East and is looking for more opportunities. E-mails seeking clarifications on the firm's operations being "unauthorised" were not answered. There are other energy firms trying to attract investments from the Gulf. A manager at another oil firm said Middle East investors remain an attractive proposition but did not comment on the FSA blacklist. Well, whaddya know? Thanks, Texasmom, for bringing this over! Solomon indeed, head office in Aruba (check), admin and "greeting" office in Florida (check, check), promise of 7% return (check). CABRUTICA, Venezuela (Reuters) -- Venezuela's state oil company PDVSA and a consortium of Russian companies expect to present in September a joint-venture to develop a block in the Orinoco oil belt, Energy Minister Rafael Ramirez said on Monday. "We'll be ready from September to start work (on the project)," said Ramirez, who accompanied Russia's deputy prime minister Igor Sechin on a visit to the Orinoco belt. A formal contract to jointly develop the Junin 6 block with an estimated production capacity of 200,000 barrels per day would be signed before the end of the year, Ramirez said. The Russian consortium includes Rosneft, Gazprom, Lukoil, TNK-BP and Surgutneftegaz. It also intends to bid for blocks in the Carabobo Project, for which the tender was delayed again on Monday. Russia and Venezuela, who share their critical view of the United States, have signed a series of energy and military accords. Various Russian companies are already present in the Orinoco belt, which Venezuela says boasts the largest hydrocarbon reserves in the world. But the extra-heavy crude oil from the Orinoco has to be processed before it can be refined. Maybe Russia will buy Valero now. Page created in 10.323 seconds with 19 queries.